A big thank you to all who made the first annual Hungry Hearts Day (October 14, 2017) a huge success. The final total raised at the fundraiser was $92,262.89. 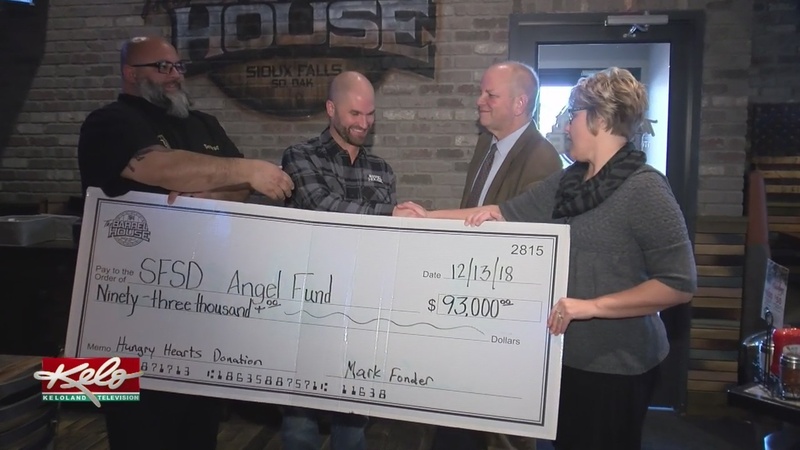 The additional funds were donated by Mark Fonder to be used for winter weather gear for children who need it. The 2nd Annual Hungry Hearts Day was another huge success. The final total raised was $93,000. We are collecting donations for Raffle Prizes, Live Auction Items and Door Prizes. If you have an item you’d like to donate, please click here to be taken to our donation form, and donations can be dropped off at The Barrel House. You may also contact any event committee member (listed below) and we can arrange for your donated item to be picked up. The easiest way to make sure your dollars make an impact is to donate directly to the event. A separate account under the Barrel House Hungry Hearts has been established at Great Western Bank where you can make a direct deposit. You may also drop your monetary donation off at The Barrel House or Krav’N or click here to make a donation online now. It is our goal for this to be a fun family event for everyone to enjoy! We will have things needing to be put together, in addition to setup and tear down before and after the event, so please fill out the contact form below and we will find a place for you! We need YOUR HELP to spread the word and make this event a huge success once again. Please download a copy of our event flyer and hang up at your work, post on your Facebook, Instragram and Twitter, invite your friends and family, and mark that you are GOING to the Hungry Hearts Fundraiser on Facebook!